"Always tell someone how you feel, because opportunities are lost in the blink of an eye, but regret can last a lifetime." "Now as I get older I realise I have many more questions I wish I had asked my parents about their lives." 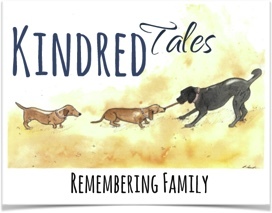 Kindred Tales is about connection and meaning. Nothing is stranger than the truth! What untold mysteries are hiding in your family history? It is only later in life that you begin to ask questions of yourself, who am I, why am I like I am? So to better understand ourselves, we must first look back at where we came from. What were the influences, social circumstance, financial demands that affected decisions. Often our search starts too late, the link to our past is broken. When a relative dies, so does their story, and that understanding of what made you has gone forever. In contrast, for the interviewee, this can often be the first opportunity to tell their story, no one has ever asked. It can offer the power of healing family breakdown. Through discovery and understanding what has gone before, can provide an avenue for reconnection and family wellbeing, as well as documenting a ‘cracking’ story. Don't delay, time is running out to save your history! "We did this (recording) very late in life. Do it now so that you still have a clear memory of the past". We record your story in the comfort of your own surrounds, be it in the garden with birds chirping or in your favourite armchair, remember it is your story and we want this to be an enjoyable experience. Add precious family photos or other digital recordings to your storyline, so no one forgets great uncle Henry and his amazing inventions, or aunt Peggy's fabulous cakes. Even your cherished four legged friends might feature. We want to make you feel comfortable, relaxed and in a friendly environment. This could be your first time in front of a camera. That's why we take time in preparation, practice and staging. We use professional cameras, sound recording equipment and editing programs to produce the best outcome. After an initial meeting to discuss your project, a clear and concise contract listing procedures, inclusions, timeframes, dates, costs, payments and obligations is provided for your approval. Once signed, the magic can begin.